I can’t deny I’ve thought about that moment many times. December 8th, 1980. 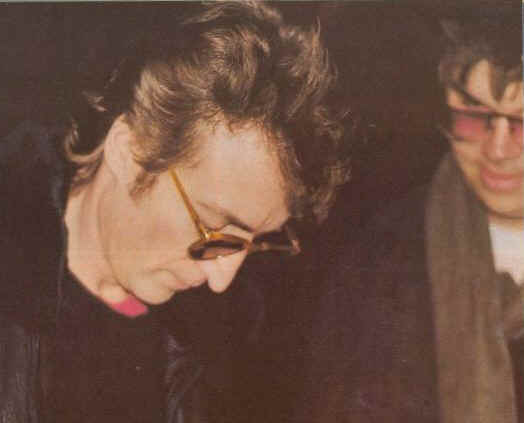 John Lennon had just come back from the recording studio, had just emerged from his limo and was walking through the arched doorway of the Dakota building, an arm full of cassettes, when Mark David Chapman emerged from the shadows, pulled a Charter Arms .38 Special Revolver, dropped into a firing stance, and began his well planned work. A life long Beatles fanatic, yes, I’ve thought about it. Even researched and read about it. You might have done the same. “I’m shot, I’m shot!” Lennon is said to have called out, staggering up the stairs in a blind panic. The nearby Dakota doorman shouted to Chapman, “do you know what you’ve done?” To which Chapman calmly replied, “I’ve just shot John Lennon.” By the time they got Lennon to the hospital, he was already dead. Completing the haunting scene, when the police arrived at the Dakota, Mark David Chapman was sitting on the sidewalk, calm as a Hawaiian Buddha, holding a paperback copy of The Catcher in the Rye, awaiting his arrest. It’s the suddenness of the whole thing that stays with you. The moment between calm and chaos. The tension between life and death. Between breath and the darkness. Four squeezes of the trigger and one of the all time greats was gone forever. A wife lost a husband. Sons lost a father. The world lost a hero. I don’t bring this up to bum you out. Okay, I sort of bring it up to bum you out. Why? I feel bummed out and I need some company. Sorry. But I don’t do it randomly or without purpose because what’s on my mind is intriguing stuff and I need you with me. 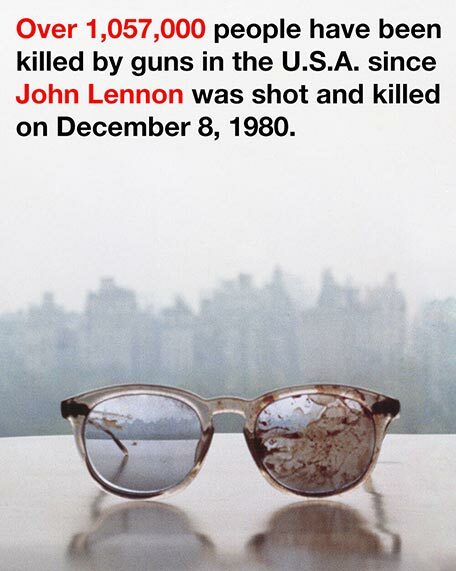 Wednesday morning, Yoko Ono, who’s been trying to draw attention to gun control and the recent debates over guns in America, Tweeted a photo of Lennon’s blood caked glasses. The ones he was wearing when he was shot. She Tweeted the image on what would have been her and John’s 44th wedding anniversary and she did so four times, each Tweet containing a different message about gun control, and the photo, whose caption reads: “Over 1,057,000 people have been killed by guns in the U.S.A. since John Lennon was shot and killed on December 8, 1980.” The stark, wintry New York skyline is hazy in the distance, though, if you look closely, it’s a bit clearer through the lens of Lennon’s bloody glasses. My first thought was of these glasses themselves and the lonely, dirty life they’ve lived for the past thirty plus years. I wondered where Ono kept them. I wondered about the courage it took to keep them and to leave them in this condition all these years. To leave them in a position to make her most vulnerable, perhaps as a reminder of her love for John, of the moment he was taken from her. Taken by a man and a gun. The say an image speaks a thousand words, but I’ve already written nearly 600 about this one in the last few minutes alone and it’s put so much on my heart and mind that I think I could write about it all night and never come close to exhausting its power and the clarity of its purpose. For all the apparent complexity of the debate over the 2nd Amendment and gun control in America, I have to say it seems pretty goddamned simple to me. Guns=death. As a Beatles fanatic, I don’t say so lightly, but I’m with Yoko.